Just like the Chrome browser, Chrome OS offers several channels for you to choose between: stable, beta and development. Each one offers a different mix of new features and stability, so you can access updates earlier if you’re prepared to put up with a few bugs. Here’s how to switch between the available channels on your Chromebook or Chromebox. 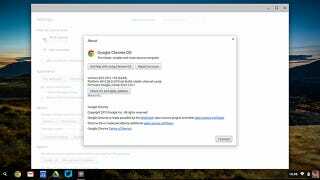 Choose Settings from the Chrome OS menu or system tray pop-up then select More info.... This gives you access to the Change channel... button which then leads to the channel selector dialog. Make your pick and click Change channel to confirm—the new software downloads in the background and will be ready to go the next time you restart. If you’re moving to a more experimental channel keep all of your accounts and local data. When you’re going the other way (from development to beta to stable), you get a Change channel and Powerwash button—in this case all local files and user accounts are erased and you’ll be prompted to log into your Google account from scratch again. As you’re on a Chromebook, that’s not such a hardship. The stable channel is the one that’s on your Chromebook by default: It gets updated every 2-3 weeks with small changes and every 6 weeks or so with a more significant upgrade. If you want to make sure your computer is as stable as possible and you don’t mind waiting a while for new features to come down the pipe, this is the one to go for. The development or dev channel is at the other end of the scale. Fresh updates from Google roll out once or twice a week and you’re more likely to see bugs or glitches in the software as new features are tested out. If you want to live on the very cutting edge of Chrome OS development then pick this channel. The beta channel is a sort of happy medium between the two in terms of bugs and new features. It’s for “seeing upcoming features and enhancements with minimal risk” according to Google, and updates get pushed out about once a week. Major updates appear every 6 weeks, usually a month ahead of the stable channel.